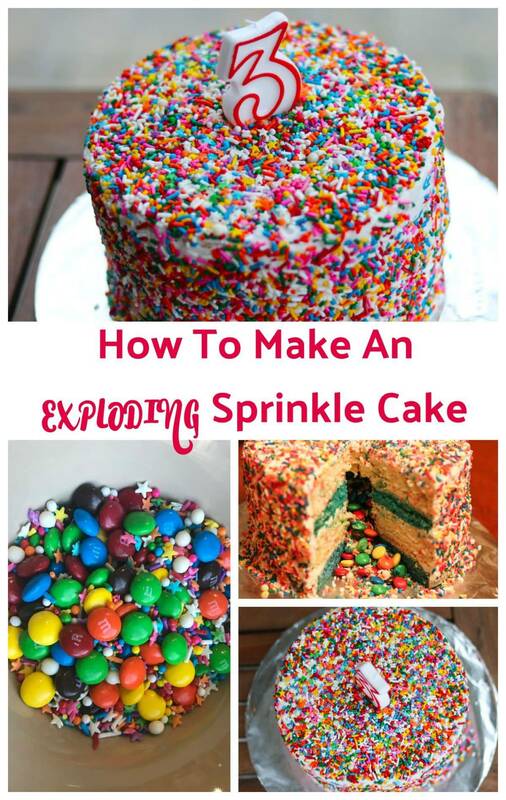 Have you ever wondered how to make an exploding sprinkle cake? Now is your chance to learn. 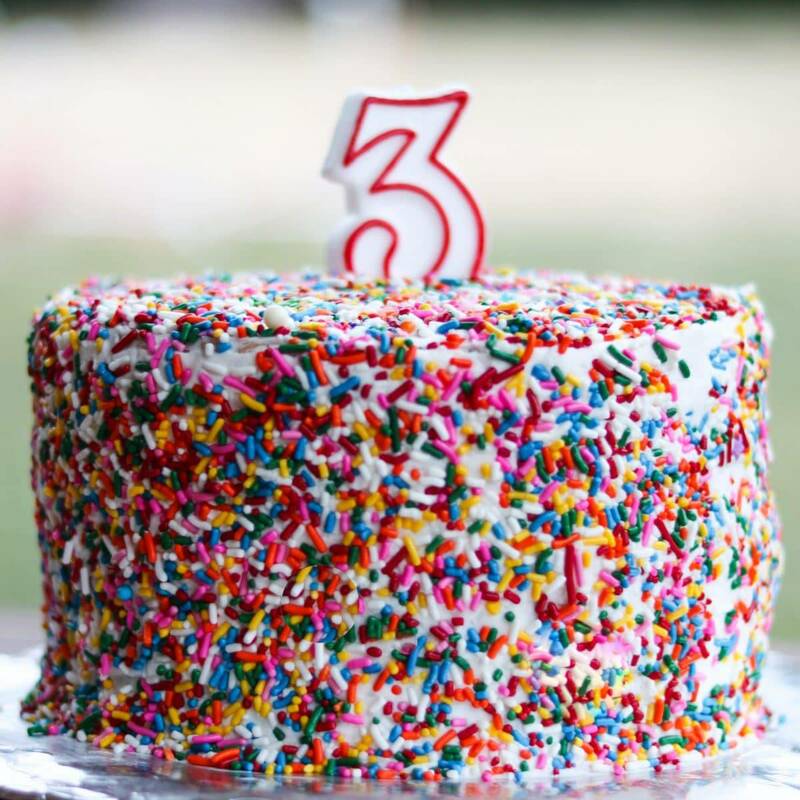 My littlest guy turned three the other day and I felt like he would enjoy nothing more than this super fun sprinkle cake. Ever since my daughter and I watched the exploding cake episode on kids’ baking championship, we knew we had to attempt this for ourselves. Believe it or not, this cake was way easier than I could have imagined. This cake came together – baking, decorating, everything – between me getting home from work mid-afternoon to people coming to my house for dinner around 6. Make this cake. You can do it. To get started, I made two cakes – four 8 inch layers total. Thank you very much, boxed gluten-free cake mixes. 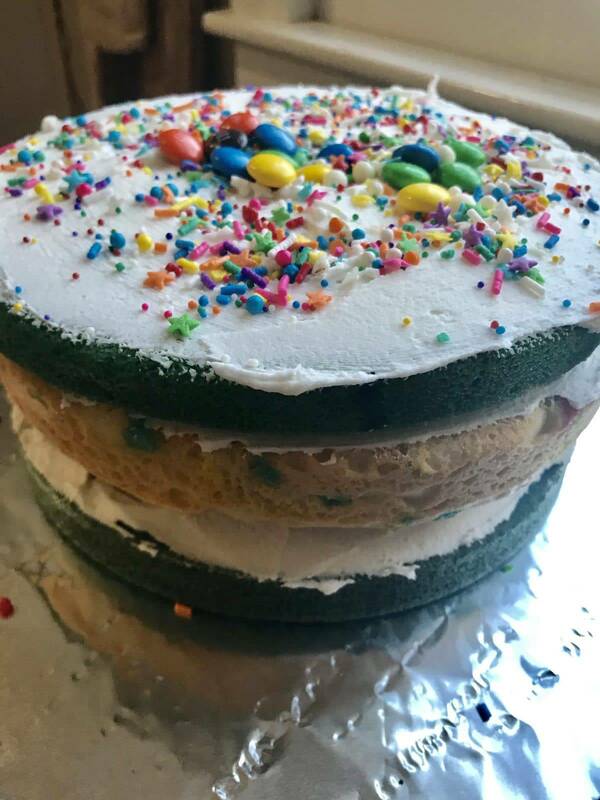 I used one box of funfetti gluten-free cake mix and one box of Betty Crocker yellow gluten-free cake mix which I died blue and teal. Beautiful blue and teal cake layers! I highly recommend 8 inch cake pans if you can get your hands on some. I found these great non stick cake pans at Williams-Sonoma and I got them for a steal. After making and cooling four layers of amazing gluten-free birthday cake, I whipped together a buttercream frosting. 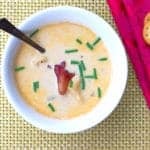 Another easy recipe. 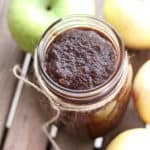 Way better than store bought. I use equal parts butter and shortening with powdered sugar, a dash of vanilla extract, and some milk to get it to the right consistency. One batch of frosting was enough to cover four layers of this cake – just enough – don’t let anyone steal any tastes before you finish frosting. Birthday Cake Pro-Tip: Use a bread knife to cut the “domes” off the tops of your cake layers before you stack them. You know how sometimes you stack your cake layers and there are these big gaps between the layers – amateur hour – use a bread knife to gently slice the dome off the top and your layers will stack so nicely and look so professional! Also … big bonus … you get to eat the cake you just sliced off the top. For each layer, after you spread the frosting lightly over the top of the cake, you can also add sprinkles. It will look cool when you cut it open. If you don’t have enough sprinkles to make it work, don’t worry, plain frosting is just fine. 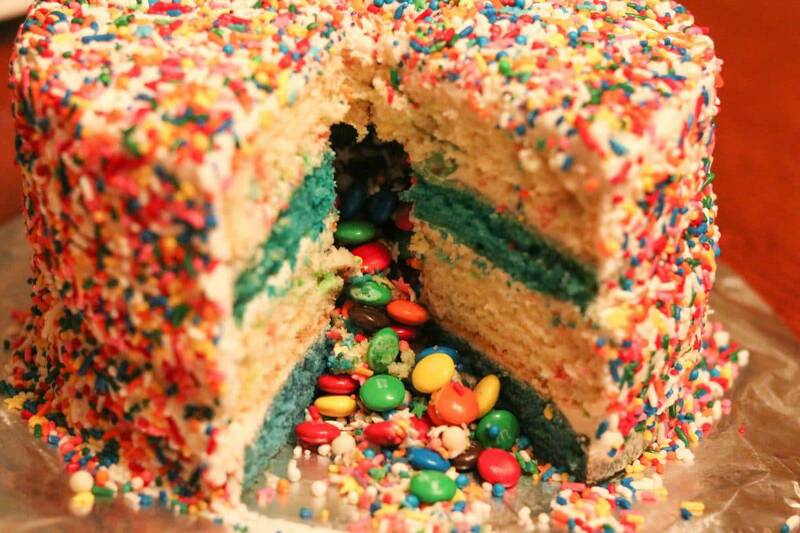 3 layers … filled with sprinkles and m&m’s in the middle! If you have made four layers for your cake, you will want to cut circles in the middle of the bottom three layers. Ideally, use a circle that is roughly the shape of a biscuit cutter. 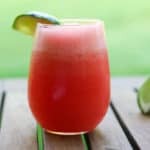 I used a smaller glass – between the size of a juice glass and a shot glass – and when I cut the cake, I wished I had made a bigger circle. Next time! Cut the circle, stack the cake layer, frost the top, cut another circle, stack the next layer, continue. 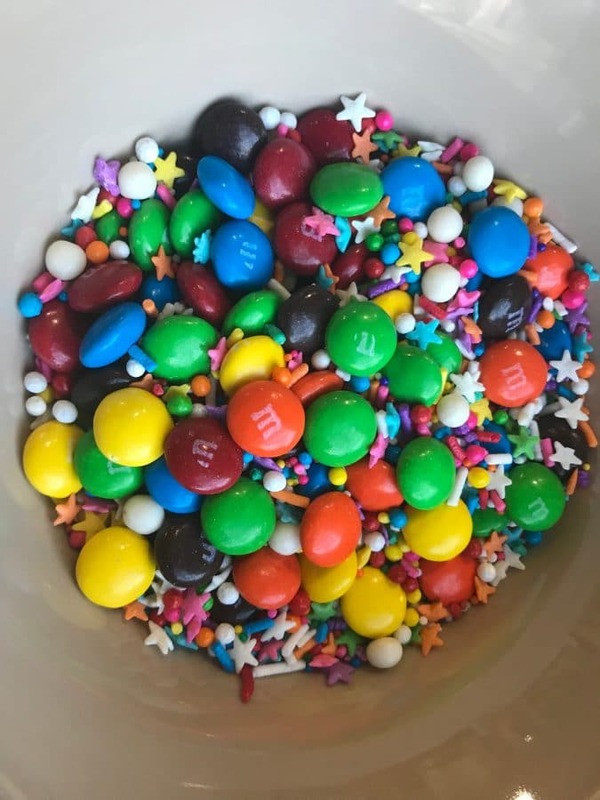 When you have three layers stacked, fill the circle in the middle with your combination of fun candy – we chose M&Ms and sprinkles. My Boston friend requested her birthday cake to be covered with Jimmies and to have Necco wafers come tumbling out the middle. Whatever floats your boat. Get creative! After you place the fourth layer of cake on top, you are ready to frost the cake. Frost with buttercream frosting. If you are pulling up too many crumbs while you frost, do a crumb coat. A crumb coat is when you lightly frost the cake, stick it in the fridge for the frosting to harden, and then pull it out and finish frosting. Sprinkle Cake – ready for action. 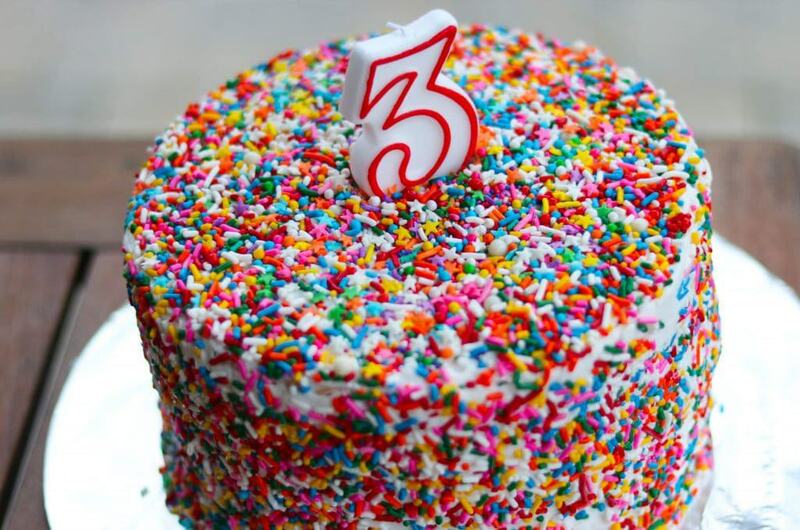 The beautiful thing about making a birthday cake covered in colorful sprinkles is that no one will notice if you have a few crumbs peeking through your frosting layer because the sprinkles will hide most flaws. 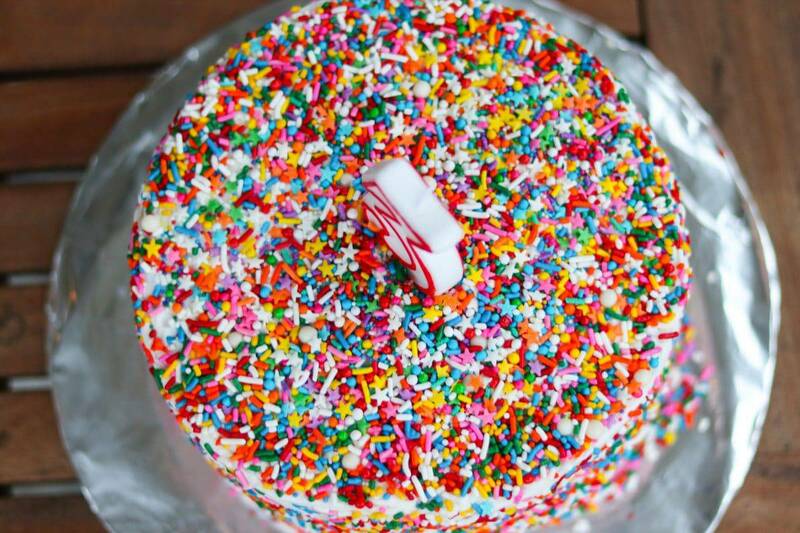 After the frosting layer is complete, quickly get your sprinkle layer on. 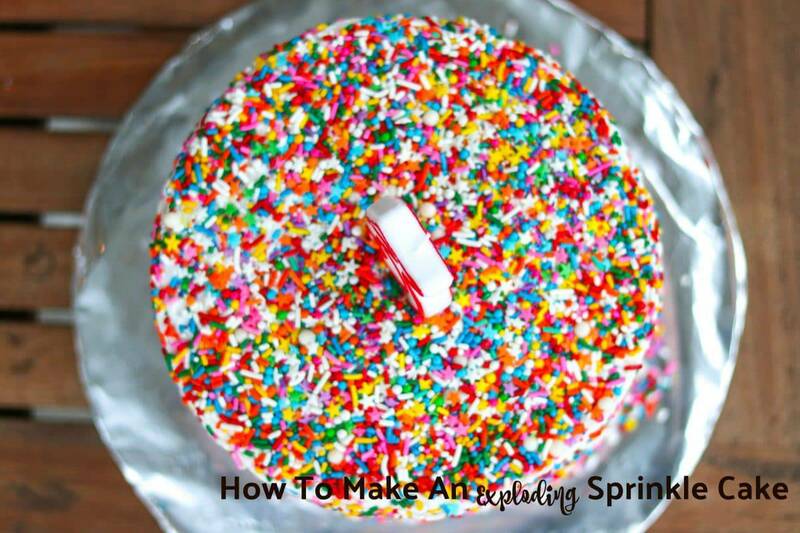 Using your hands, take handfuls of sprinkles and press them into the sides and top of the cake. Many sprinkles won’t stick. 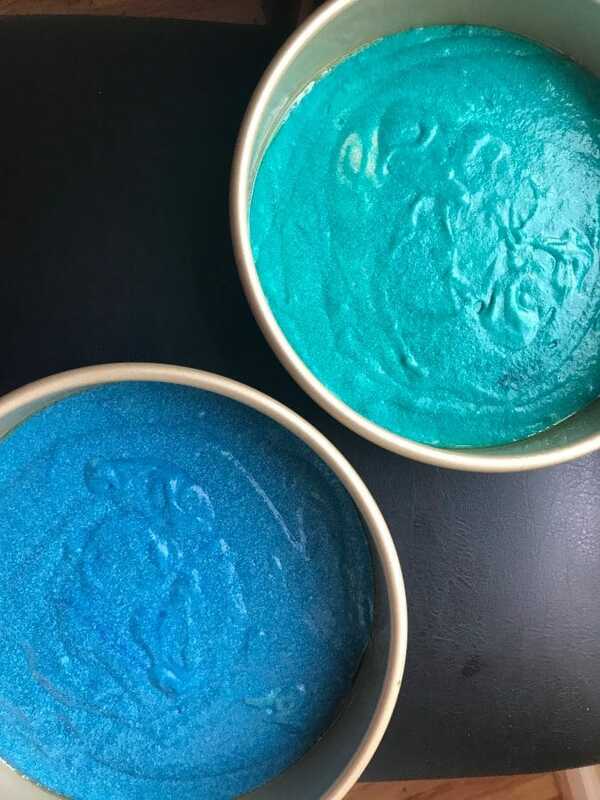 Do this project in a place where it will be easy to recover the sprinkles that don’t stick and scoop them up to continue pressing them to the sides of the cake. Another birthday cake pro-tip: When I decorate my cakes, I take cardboard circle rounds purchased at Michael’s and cover them in foil. The cleanup is easier than it would be if I was trying to frost and decorate directly on a serving platter – frosting everywhere. The frosting mishaps wipe right up with a little cloth. And that’s it … once your cake is sufficiently covered with sprinkles, you are done. Your masterpiece is ready for the big time. Your little (and big) people are ready to be wowed as candy falls out of the middle of their cake. Take some photos (and video!) and show me how it goes! Read below for the perfect frosting recipe and printable cake instructions! Enjoy! 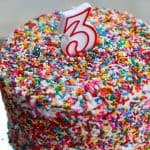 Follow these easy directions to make a fun, exploding sprinkle cake! Bake and cool for gluten-free cake layers. Cut the domes off the tops so that the layers will lay flat. Cut circles in 3 cake layers using biscuit cutter or similarly sized glass directly in the middle of the cake. Stack layers, one at a time, lightly frosting between each layer. Add sprinkles. 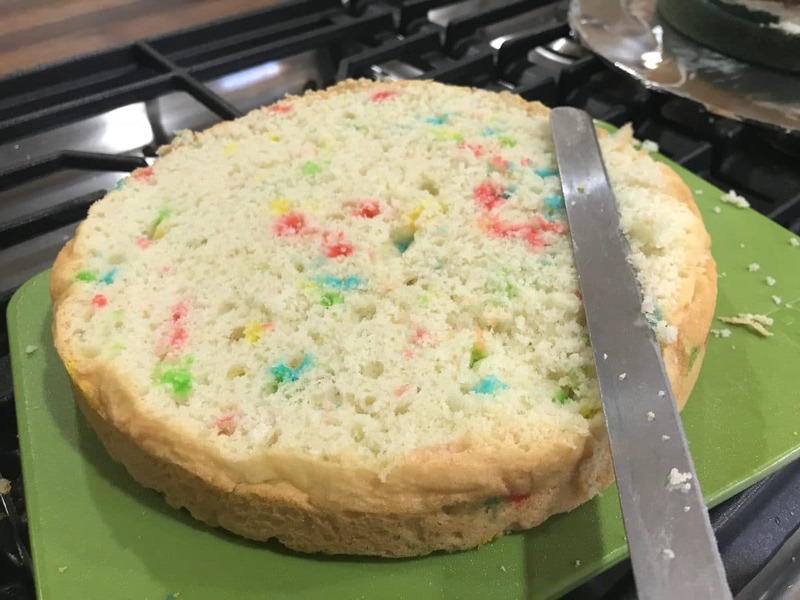 After three layers have been stacked, fill the hole in the middle with sprinkles and M&Ms. Top the cake with the fourth layer. 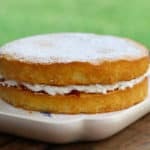 If necessary, lightly frost the entire cake, stick in the fridge for frosting to harden for about 10 to 15 minutes, and then finish frosting the cake with the buttercream frosting. When cake is completely covered in buttercream, cover the entire cake liberally with sprinkles. Use your hands. Scoop the sprinkles into your hands and press into the frosting. Retrieve fallen sprinkles and keep repeating until cake is completely covered. I love this fun idea! Thanks so much, LeAndra!! It really was so fun! Even the adults loved it! This is just about the happiest thing I’ve seen all month! Thanks so much!! It really is a very happy cake!